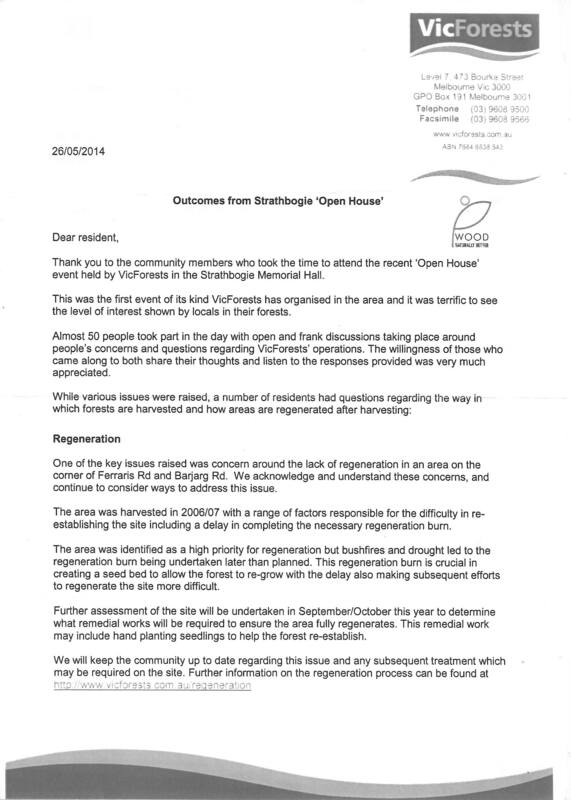 26.5.14 – Outcomes from Strathbogie ‘Open House’ pg 1, pg 2. 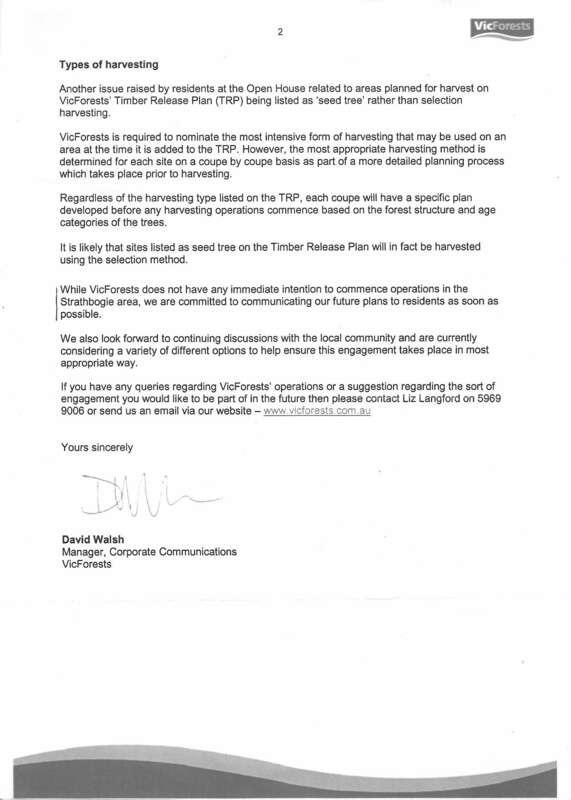 VicForests community letter. 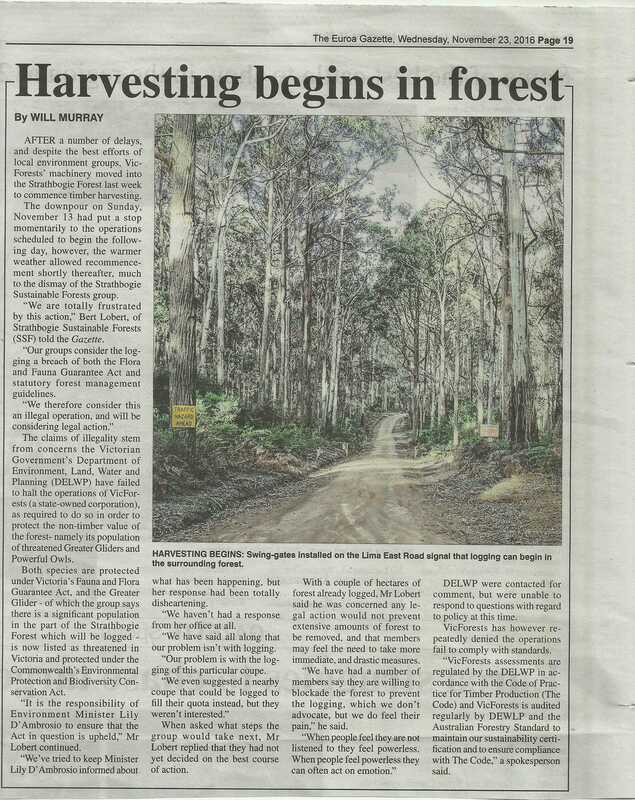 VicForests response to the AFR article. 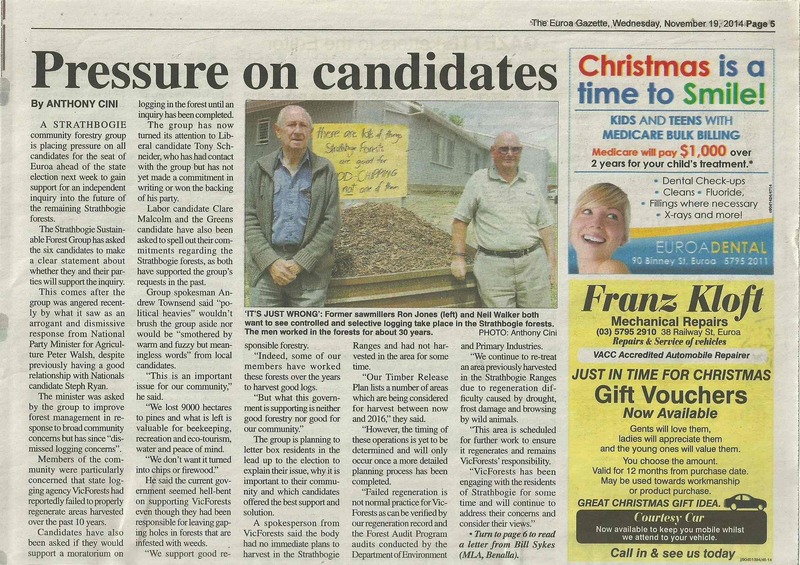 19.11.14 – Pressure on candidates. 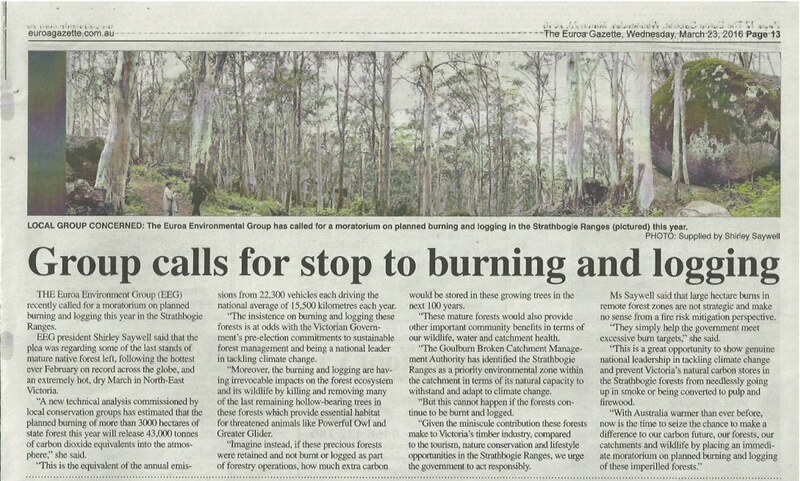 Euroa Gazette. 18.2.15 – Planning to ensure successful regrowth. 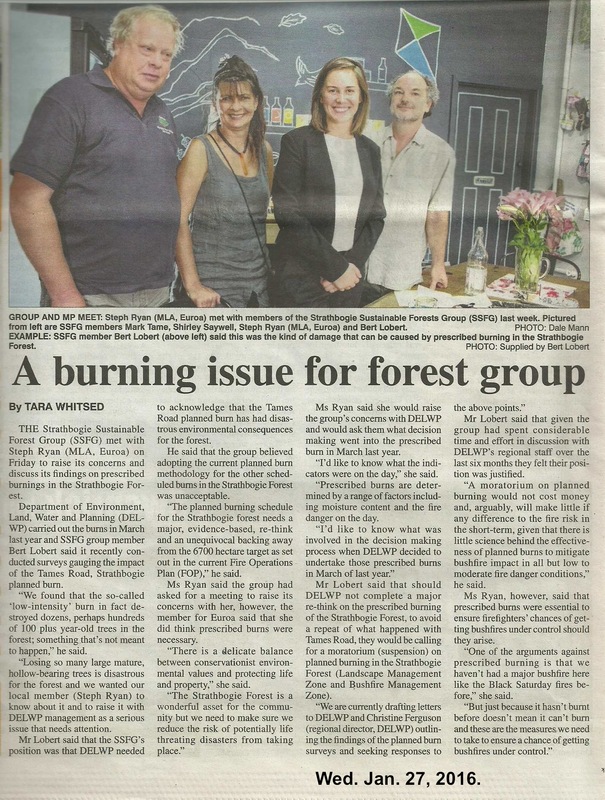 Euroa Gazette. 21.6.16 – Forests worth more in carbon than logging. The Age. 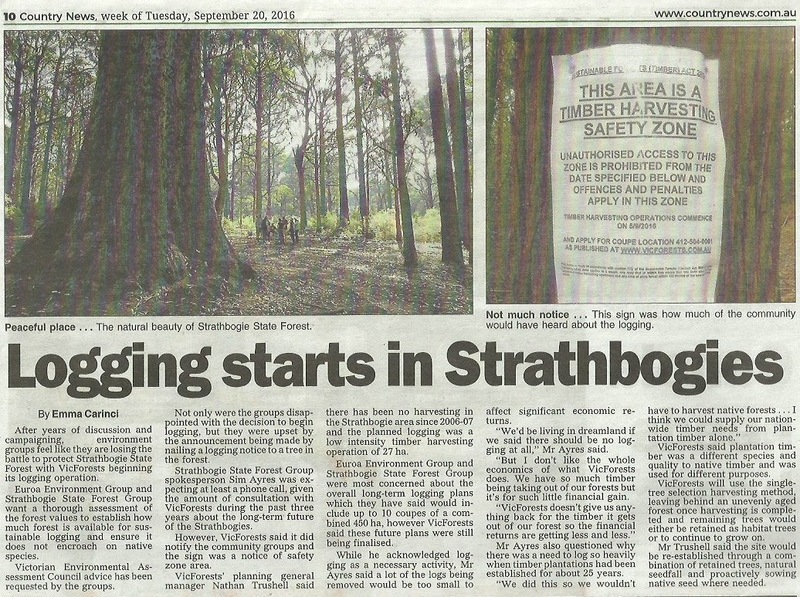 20.9.16 – Logging starts in Strathbogies. Country News. 4.10.16 – Bush group angered at forest plans. Country News. 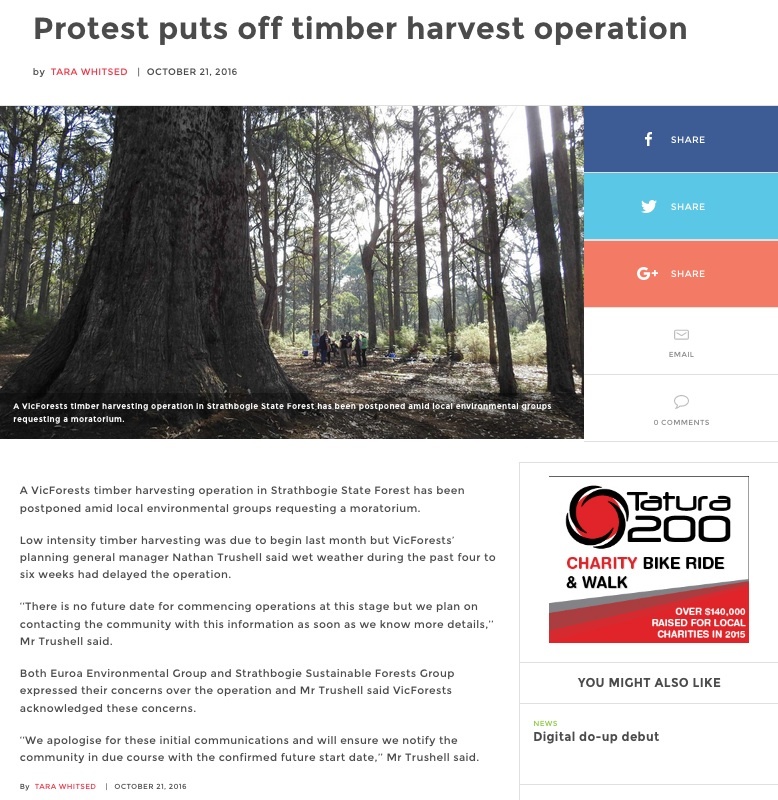 21.10.16 – Protest puts off timber harvest. Shepparton News. 23.11.16 – Harvesting begins in forest. 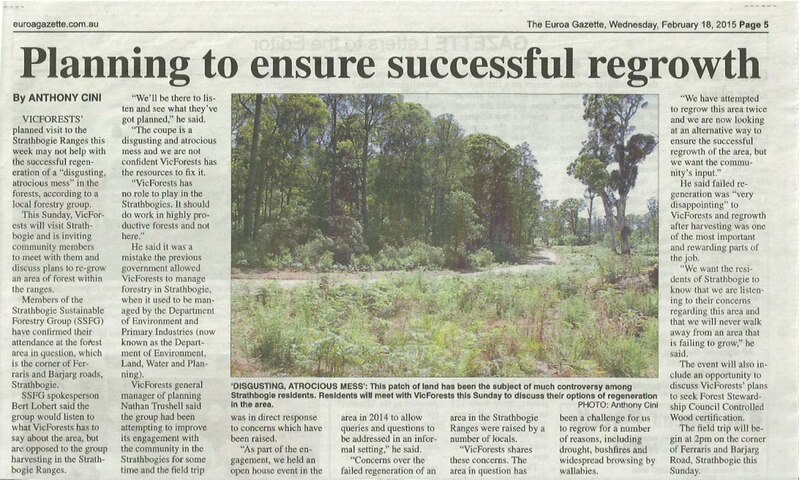 Euroa Gazette. 29.11.16 – Next fight is in court. Shepparton News. 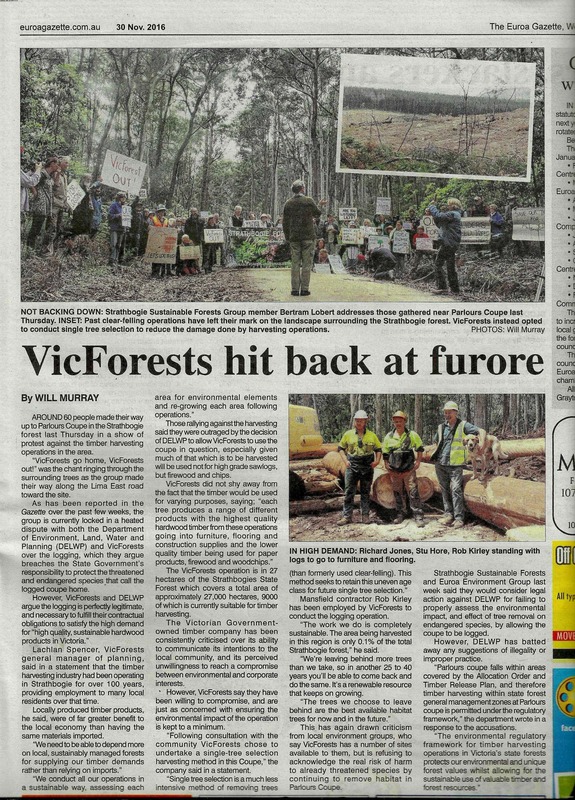 30.11.16 – VicForests hit back at furore. 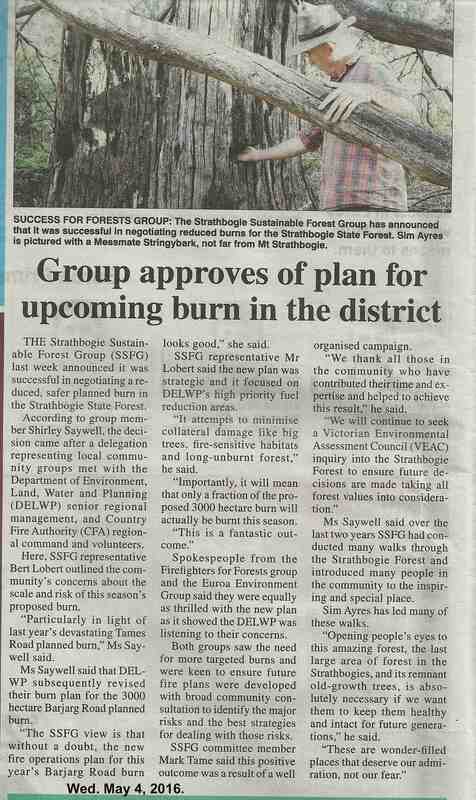 Euroa Gazette. 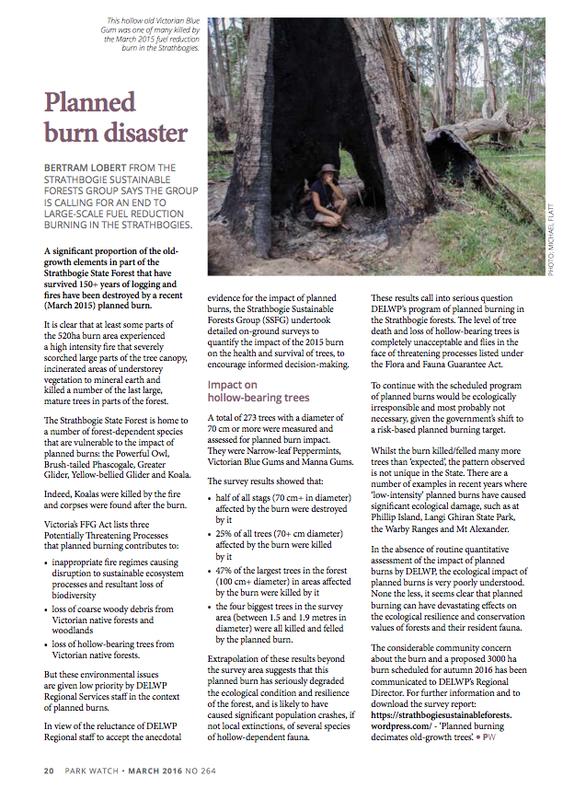 March 2016 – Planned burn disaster. Park Watch, VNPA. 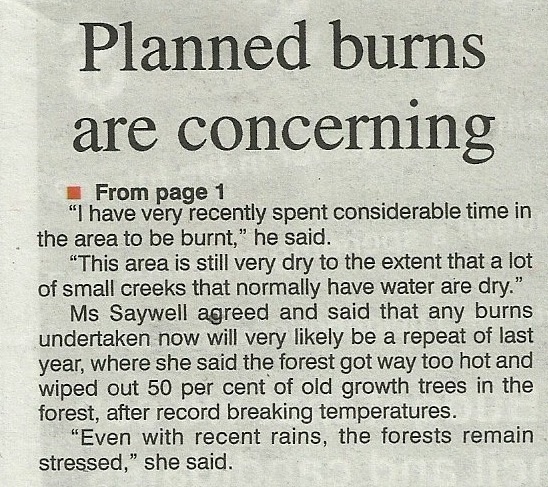 VicForests response to above report. 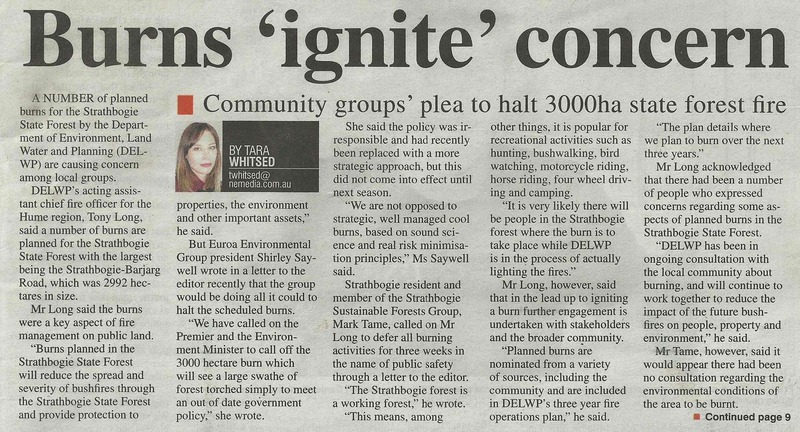 Planned-burn impact assessment – Tames Rd, Strathbogie. SSFG. Thanks Liam – have included your link (above).